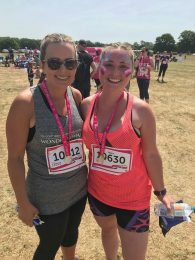 On Sunday 24th June, Residential Property Lawyer Catie Edwards and legal secretary Laura Patterson took part in the Race for Life in Ipswich. It may have been the hottest day of the year so far but Catie and Laura bravely put on their running shoes and completed the 5km course in Trinity Park Ipswich without stopping! Catie and Laura trained for the two months leading up to the race and were delighted to finish the race in just under 37 minutes. Well done ladies! Race for life is a nationwide event for women which aims to raise money for Cancer Research UK. The TSP ladies raised a fantastic £422, more than doubling their original target of £200. If you would like to make a donation you can via their Just Giving page here. Cancer Research UK is the world’s leading charity dedicated to beating cancer through research. The charity carries out research to find new ways to prevent, diagnose and treat cancer with the aim to save more lives. You can find out more about the charity here.